The former Barclay's boss wants to build the continent's biggest finance group. ‘You need balls of steel’ to invest in Africa, Aberdeen Asset Management’s CEO Martin Gilbert told MT earlier this year. 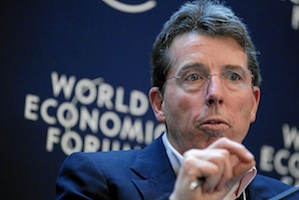 And Bob Diamond’s clearly on a mission to show he’s got what it takes. Since his controversial departure from Barclays in 2012, Diamond’s got into bed with the entrepreneur Ashish Thakkar to found Atlas Mara, a holding company that has been investing in African finance businesses. Once dubbed the ‘unacceptable face of banking,’ after a fall-out with the Government over his pay packet, Diamond will be hoping that the risky venture will win him plaudits and help restore at least some of his reputation. Last night at the FT’s Banking Summit he hailed a ‘once in a lifetime’ opportunity to invest in financial services. As Eurozone banks seek to offload €1.4tn (£1.1tn) of their ‘non-core’ (i.e. riskiest) assets, Diamond hopes to bag a bargain by snapping up the spoils as he builds his new business. Diamond and Thakkar launched Atlas Mara almost exactly one year ago and have since raised more than $600m (£380m) to help fund their aim of building the largest finance company in sub-Saharan Africa. It’s since acquired stakes in the Union Bank of Nigeria, the commercial arm of the Rwandan Development Bank, and others in southern Africa. Having led Barclays, which has a big presence in Africa, Diamond should be aware of the risks. Let's just hope his balls can take it.